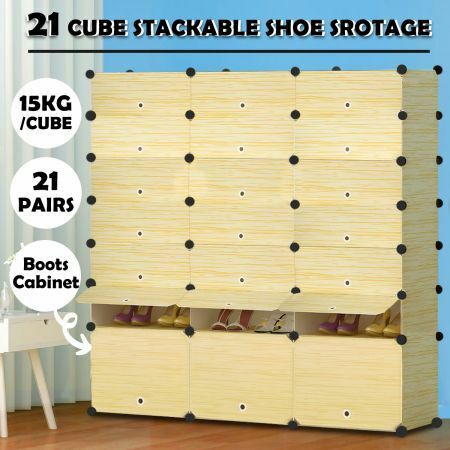 Keep your shoes neatly stored with this DIY 21 Cube Shoe Storage Rack 42 Pairs Shoes Cabinet Cupboard Organiser Shelf. Its DIY feature guarantees you to arrange the shoe shelf into different shapes to place in different place. 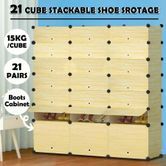 Designed in 21 cubes with 10 kg load-bearing per cube, this shoe cabinet allows you to hold most of your shoes as the way you like, including casual shoes, heels, flats, sandals and more. For your peace of mind, this shoe storage is built with eco-friendly PP plastic panel, ABS connector that will keep the dust, moisture, mildew, and bacteria at bay. Moreover, this wardrobe is a perfect storage space to hold books, toys or other essentials. Assemble is extremely easy. Get your loved stackable shoe rack to say goodbye to messy shoes around your house.